"Seema was born in Bombay but moved to New York at 5. She's lived here really her whole life, and so I smiled when I picked up on her light Indian accent, ..."
Cooking with strangers can feel a little stranger than expected. "Look away now if you are having your lunch: we compile a list of some of the strangest food specialities from around the world." South Korea is promoting food as a key element in its latest national rebranding campaign. Fresh cilantro, mint and other herbs are central to Vietnamese dishes as soups, rolls, salads, stir fries, etc. 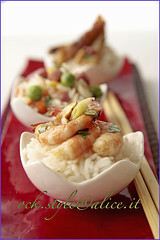 Included beautiful recipes of rice noodles with chives, shrimp and pork, and a soup with salmon, tomato, dill and garlic. Where once the local selection of Vietnamese herbs was sparse, today a wide variety is available at markets in Southern California. "In Taiwan, sea salt is being whipped into the creamy foam atop sweet coffee"